This stunning chest of drawers will give your bedroom a refined traditional style. 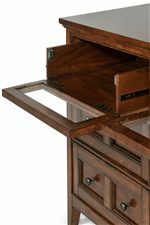 The warm cherry wood and antique brass hardware complement each other exquisitely. 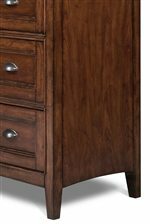 With five large drawers, this chest will meet your bedroom storage needs. The Harrison Drawer Chest With 5 Drawers by Magnussen Home at AHFA in the area. Product availability may vary. Contact us for the most current availability on this product.